And I got rejected. Back in 2014, when I was trying to submit my website templates at open marketplaces, it rejected me like anything. I had gotten rejected for the NINTH time and out of frustration I started my own templates/themes website to express my designs. I had around ten designs that my clients had rejected. In spite of this, I decided to share them to the world for free, if in case someone wanted to use it. I then contacted (literally spamming) some of the top bloggers to make them feature my website and designs. And guess what, I started getting amazing replies from these bloggers. In JUST 15 days, my website got 1600+ views per day. I was also fortunate to have a lot of friends who were technically assisting me voluntarily or sometimes simply with a cup of coffee treat. For almost five months, I was giving away my website templates for free and I was making some money out of the google ads. In April 2015, I decided to make my templates ‘paid’, which eventually turned out to be a good decision. I started making around $14-$38 a day, which was a pretty decent side-earning for me. After some weeks, Nepal got hit by a massive earthquake. Now, I was completely lost as to how the market of Nepal will go. This website was my only hope since I was getting good flow of money in my account while living under a tent outside my house. I did have a full-time job of my own but this side-earning was adding confidence during that disaster phase. My earning use to go from $200 to $500 a month. With this product, I applied at startup-accelerator programs in Nepal and again I got rejected often saying ‘The product is not viable’ or ‘We don’t understand the business model’ or ‘We cannot give you the mentorship this business needs for its growth’. I was struggling to find the kind of mentor I was looking for, investors were the least of my concerns. At this point, I wasn’t as excited as I was in the beginning because I could feel that the product cannot grow if I do it alone only with my expertise. There was also a point where the site had started losing its traction. In 2017, we were in the process of pivoting the product to wordpress themes and during this course, I met a friend at a blogger’s meetup at Coffee Pasal, Durbarmarg. I came to learn that he was also involved in the same business. We met again after the meetup to talk more since he showed his interest to invest in and help grow my business. Right after a week, I sold more than half of my business’s share to him and one more friend. Losing my portion of share could lessen down my earnings but I also knew that making them a part of my business would make the size of the pie itself bigger. We three teamed up and decided to add investment to hire a great developer, designer and writer. I then had a talk with one of my friends, who was initially helping me in developing the product, to join us as a full-time developer. He happily accepted the offer and joined our team. In the first month, we were hardly making any money but in the next two months we grew tremendously. In six months, we were already in profit and were now able to pay salary from its sales. We could now also afford to make savings for the company. The spike in our growth was pretty strong but at the same time we realized that some improvements needed to be made in the product for its sustainable growth. We also understood that the level of expertise needed for this kind of enhancement is not in our hands. In September 2018, we decided to exit from this product as we could see the potential for its growth but it required a different level of expertise. From the same bloggers’ network, we had a friend who was ready to help us find a potential buyer. After several meetings and connections, we finally landed on someone who was interested to fully acquire the product. We then went through two months of due diligence and successfully handed over the ownership. We wanted to share this blog to encourage people to accept rejections and trust your idea, you never know where it can go. Don’t be afraid to take chances just because some people do not nod along with you. And yes, always say yes to side projects. Had I not been rejected, I wouldn’t have never started my own product in the first place. Had I not been rejected in the startup-accelerator programs, I wouldn’t have met new co-founders. Had I not sold out the share of my product to them, the size of the pie would never grow. Had I not attended bloggers meetup, I would never have found a mentor who helped me make my product bigger. I eventually became WE! Had we not exited, this product would not grow to the best it can. We have strong NDA(Non Disclosure Agreement) with our buyer so cannot mention the products URL and Financial details. It has been a while that I took part as a participant in any of the camp. Being involved fully in my own venture has actually made me think that I have enough of learning. Back in July, while having a coffee with Abhishek, he told me to take part in this camp that is happening in October. I happily accepted his invite. I met Mahesh around August and he invited me for the same. This gave me super confidence that this is something I have to. On the first day of the camp I was late by 3mins, the auditorium’s door was closed, I was shock to see that these guys are super punctual. Later I found out that it is happening next day only. I reached super early, a day before. I could see 95% of the participants were new faces to me. The first day of the camp was all about identifying a problem. This was the best thing about this camp. The other camps that I attended were solution driven while this let us think only about problem for whole day. We went for market research and ask about “Attention span issue in Teenagers”. I acted bit lazy, I went to one of the cafe, met a guy who can give me best survey result for it. I made phone call to a teacher and a student. That whole day we discussed about the problem and when I reached home, that was the first thing to research on. The first thing that we had to do this day was to give a presentation on the problem statement. We were given 1 hour for preparation and 3mins for the presentation. Gate 1 Presentation: Out of 8 groups, 2 groups would be eliminated for their presentation. And we become one of them. Eliminated. We then had to look for a new team and Me & Utsah got a new common team “Finlay: Financial Literacy in Teenager”. The switching of team was the best thing that happened to us. One day our mind was fully focused on one issue and another day its totally different. From here on, we had to work on the solution, and for us as we switched the team and topic it was not easy. We spend a day on identifying problem on one issue and from this day we had to work on the solution of another issue. We had to unlearn. It took us almost a day to understand the new team and topic. The very first thing that new team member, Manish told me was “Your presentation was not good today, so tomorrow you and me will work together on it”. This is something I needed, someone to tell that I need to work hard on my presentation skills. After reaching home I got a new topic to research on again. The best thing that I find on Day 2 was the honest feedback circle, it seriously pinches you. We all were suppose to give honest feedback to each other about the presentation and many more. We had to go for market research to validate our idea to the solutions on the issue we were trying to address/solve. While Manish, Bijay and Utsah was out for market research; Me and Mallika were brainstorming on our idea and presentation. The idea pivoted from a “Training programs on Financial Literacy” to a website, then mobile app, a workshop, sports competition and many more. The best thing that I liked about this group was the acceptance and respect on each-others idea. Almost everybody gave alteast one great solution. I will never forget our team running around looking for A3 sheet paper and turn it into a prototype brochure in just 20mins. Our presentation and prototype was liked by all. We got through it and got selected for demo day/Bucsbin Symposium. The next day was Bucsbin Symposium and 3 winning teams from Kings College and 3 winning teams from KUSOM were suppose to present at Himalaya Hotel in-front of delegates from Finland, students, teachers and government officials. I always follow Finland education system and there is no doubt that they are one of the best education providers in the world. The whole 3 days of camp was all about teaching process rather than result. It actually teaches us how to think, how to learn & unlearn. Analysing a problem using 5 Whys is possibly the best way to identify a problem. I learned to accept humility, time management, pressure handling and not to be perfect but good. Most important, Being with a right team can make anything possible, and here is my team, FinLay. Thank you Kings College and Bucsbin Team for giving me one of the best experiences of life. I promise that I will be taking this session back to others colleges and organisations that I am involved with. I don’t remember when was the last time I gave full attention to the TV show, probably when I was in school. Bringing Nepal Idol franchise is one of the best decision that Nepali media has done. This has brought back people’s attention to TV shows once again. I am one of the regular followers of it, despite my schedule and work, I manage to give my time. Nepal Idol has created a disruption for re-building the market of Nepal. Nepali media was in need of an Ice Breaker. Many media houses were trying their best to bring great shows but mostly failed to do so. Nepal Idol became the best Ice-Breaker, now we can expect better shows ahead. Television shows were almost dead, there were hardly any shows that are being watched by everyone. Now, people have started watching TV all over again, those evening time with family has come again. Out of all those regular political news we have a better topic to talk these days. Every Friday we at our office talk about Nepal Idol at least an hour or more, and I am sure it’s there in many places. The success of Nepal Idol is a great motivation for event organizers. The number of sponsors and supporters that Nepal Idol have is what gives a confident to event organizers to bring more similar and great events. One best thing that I like about Nepal Idol is the feeling of collaboration over competition. In fact, the contestants are competitors but they support each other, they appreciate each other’s talent. That’s the best spirit of sportsmanship one can have. To make living out of music was quite difficult but the craze of Nepal Idol has given confidence to music enthusiasts to take it as a career. If one has a talent then career in music is definitely not an issue. Above all these are my personal opinions only, if there are more suggestions and feedback then I can incorporate for sure. How often do you see advertisements of Indian brands in Television? A lot right. How often do you see advertisements of International brands other than India in Television? Few. We never see advertisements in TV channels like HBO, Cinemax, (Pardon me if this has changed recently). That’s clean feed. But in a case of Nepal that is not what we can implement at the moment. Globally, there are two types of television channel into practice, one is the Pay channel, where the viewers pay for watching particular channels. The other type of channel is the Free to Air channels where viewership is for free. Although the free to air channels operate with the advertisements, they don`t charge the viewers. However, there is an international trend where Pay channels operate without showing any advertisements to the viewers as they are charging the viewers. The narrative behind the argument of clean feed is the policy reform. Whereby, the Paid T.V channels in America, Europe, and South East Asia cannot show content with advertisements. However, they can charge the viewers accordingly. The clean feed policy is strongly implemented in other countries in South Asia. Globally, Regulation of paid and unpaid television channels is not a new practice. Pakistan does not allow foreign television channels to charge their viewers money. Sri Lanka and Bangladesh regulate advertisement broadcasts on foreign television channels.When the new policies come into effect, even local cable operators cannot embed advertisements into content that is broadcast by foreign channels. Television broadcasters and cable operators will have to sort out technical difficulties to implement these policies. Clean Feed Policy: creating opportunities for Local Ad Agencies. The foreign channels entered Nepali households after the National Transmission Act and Guidelines in F.Y 1995/96. Such channels are thus operating in Nepal charging the viewers along with the advertisements. Many foreign channels are going on air after paying for the advertisements in India. Such channels come to India without advertisements and are shown to Nepal filling the content with advertisements there. The Clean Feed Policy will certainly change the way Nepalis have been watching foreign television programs for years. The Ministry of Information and Communications has set a time frame along with the strategic document to implement the policy, with the aim of ushering in a new era of uninterrupted television viewing. As many as 147 foreign channels have been allowed to broadcast television programs in Nepal, more than 100 of which are paid channels. But even these paid channels broadcast content with several commercial breaks. Viewers pay for the content and end up having to watch the advertisements too.Only some paid channels, such as HBO and Cinemax, have been broadcasting television shows free of advertisements. Most Indian channels charge Nepali viewers but also feature advertisements. This comes as a relief to the struggling advertising industry as there are claims that the turnover with growing by at least Rs 2.5 billion once a clean feed is implemented. Clean Feed, thus, can be handy in creating an opportunity for the local ad makers and others stakeholders associated. The strategic implementation plan is underway which if implemented well will do wonders in Nepali market by creating an opportunity for the local artists. What I have to say on this. We see Shahrukh Khan, Amitabh Bachan, and many Bollywood actors’ voice being dubbed in Nepali and endorsing brands, that’s sad. Let’s just replace them with our local actors, that’s what Nepal need at the moment. Let the advertisements run in every channel but replaced by local advertisements, this can be win win situation for the advertisement agencies and television providers and operators. The implementation for Clean Feed in Nepal is must, to develop advertisements, movie, media, modeling, music sectors of Nepal, but a flexibility in implementation is required. Thank you Sabik Raj Neupane for helping me in this writeup. It was frustrating to see service businesses are cheating customers in Nepal. Last 1 week was one hell of a week for me cause of Worldlink. 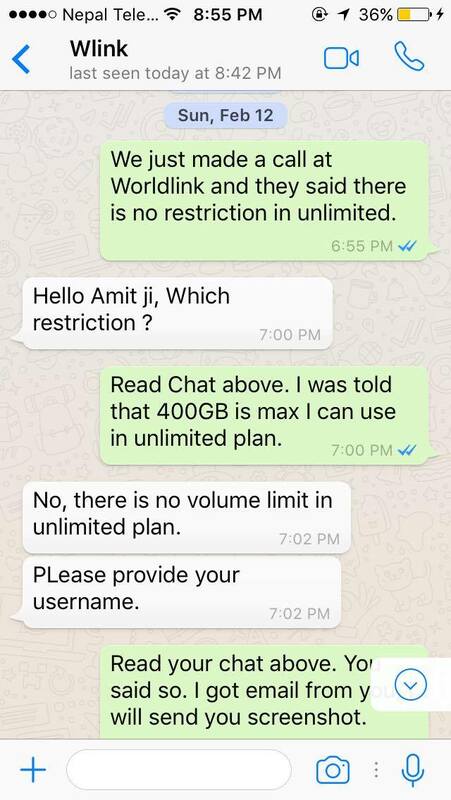 I have been using UNLIMTED data pack of worldlink since 1 year but last week they told me that Unlimted is not Unlimted. Now, after a week of discussion, I have got my answer i.e. Unlimited = 400GB a month. Here is the discussion I had with wordlink for a week. I then contacted their customer support and had this discussion and this is what they had to say. Then I checked their website and they have not mentioned anything about FUP in any of the plans, nor there is any section where you will accept their terms and condition. They just have link of FUP in some corner of the menu. 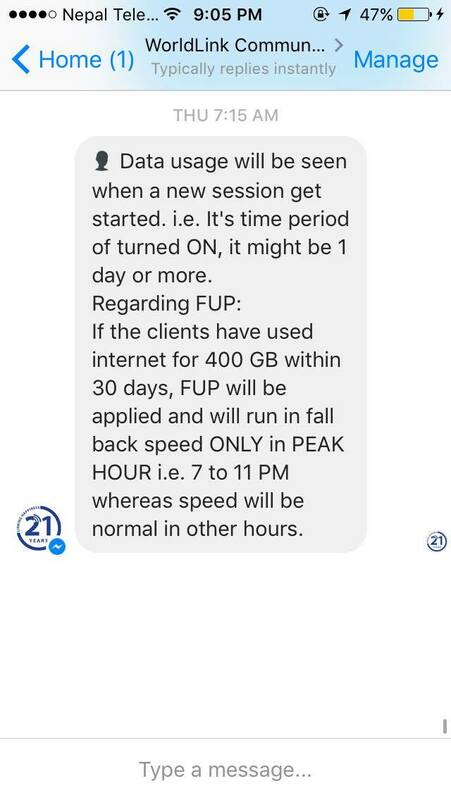 So this clearly shows that customers are misled with the wrong information of UNLIMTED, nowhere mention directly about FUP. We called Worldlink on this day as a new customer enquiring about Unlimited but they said “Unlimited is unlimited no restriction as such”. Then I had chat with them again, they clearly said there is no restriction for Unlimited data plan. Screenshot below. 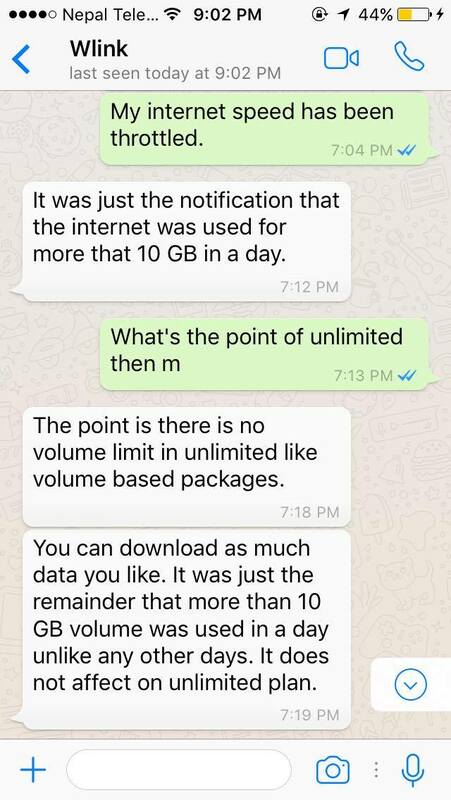 Now they gave me hint that unlimited is 10GB a day. 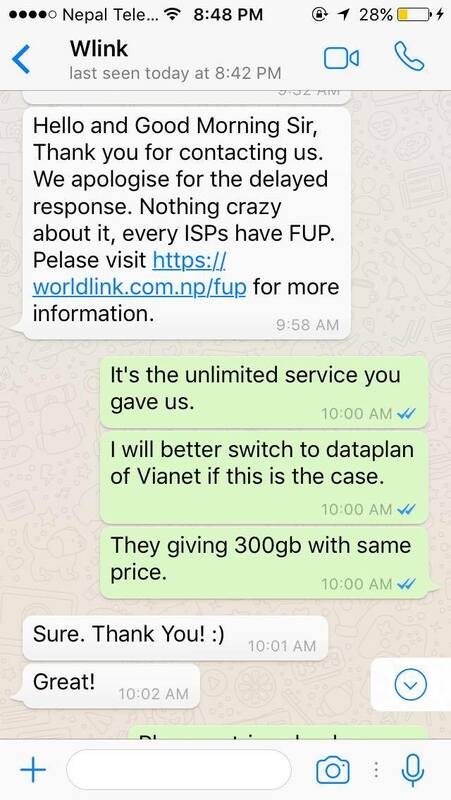 I contacted them again and this is what they have to say about Unlimted plan. 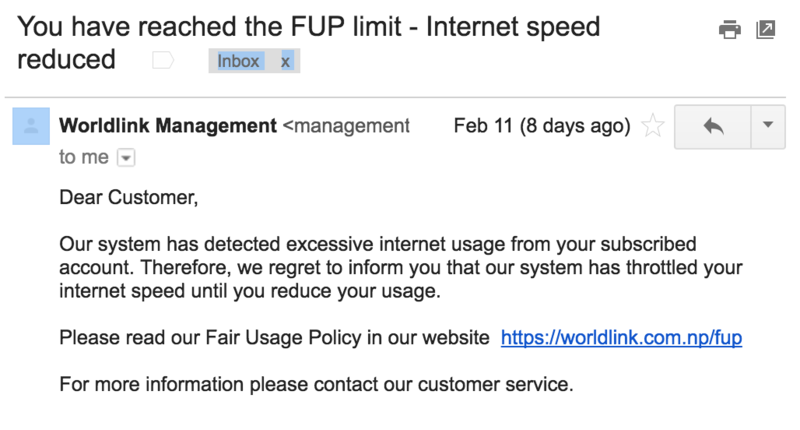 Today I checked their website and they have now updated the FUP information in the data plan section, finally, but again without any link to the FUP document, just a static line. 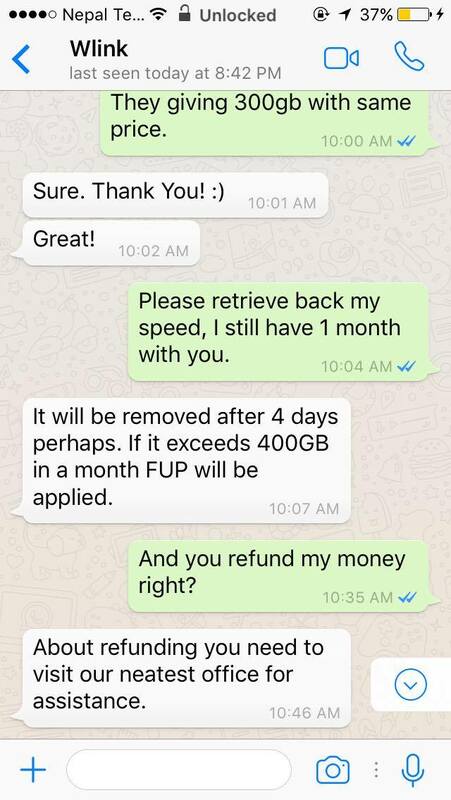 I hope they shall inform their customer about FUP while selling it. Thank you Worldlink for listening to me. Year 2003, after SLC : I got sales job at WAVE magazine. Realised I am too young for it and I left in a week. Year 2003-2005 : Learned to make handicrafts, back then family business are always good skills to have. Passion for music, Rezon pocket’s money were used to buy musical instruments and participate in band competitions. Apparently lost. Year 2006 – 2007 : Started taking projects of video, photography, animations, editing. With a small handy-cam and go to events, take videos and make some money and atleast supports my pocket money. Year 2006 – 2007: Started prempatra.com.np with Aadar & Rezon and get involve in events as promotional partners, could not earn even to pay hosting. We used to pay Rs.1500 per year for 10MB. Thats where we developed web design skill and make design in short time 🙂 as we used to release new design every week. Started ktmpasal.com, online marketplace for nepalese, where they can buy groceries using their ATM card. Seriously we integrated ATM card with website back then. Went to visit banks, get scolded badly from IT departments with their security concerns. In 6 months we hardly made 6 orders. We closed it. Business model changed and we started online bidding for products. Didn’t work out either. Started an online community Sathiz.com, while facebook was not even popular in Nepal. Year 2008: We realised we are ahead of time, our ideas were too advance that this market cannot resist. (Look at the number of online stores now, happy to see the ideas we had in 2008 are doing good business now). Year 2008-2010: All of us frustrated and joined jobs. I joined YOMARI, refAshish dai. Year 2010: Entrepreneurship stroke back again in mind. Took some freelancing projects from US, clients never got back after project completion. Frustration again. Year 2010-11: Worked with many startup companies as designer, never ever satisfied, low pay or no pay. Year 2011: Started getting lots of projects from ODesk with the help of Bicky,Subash. Started making good money. Year 2011: Started making good money and spend it over beers and parties, bit spoiled. Then invested in online business in India. Legally shut down. Broke as hell. Could not return loans, loans kept on adding. Beer habit gone down to Chisapasal every evening. Year 2011: Invested in restaurant. Shut down after 10 months. Broke again. Year 2012-2013: Co-founded Pagoda Labs with Shoki Dixanta. Successful venture but not good enough to pay my loan. Year 2013: Freelancing (Nightshift $$ jobs). Waiwai and jhol momo became regular lunch. Almost gave up on everything, started hunting jobs in India and Bangkok. Year 2013-2015: Joined EB Pearls ref Saroj dai. Founded – The Bootstrap Themes and few projects from US to pay loan. Year 2015: Loan cleared that I took at 2011.
year 2015: Joined Leapfrog Technology Inc. as Project Manager. Year 2016: Entrepreneur journey seriously begin to scale-up Namaste Kathmandu and The Bootstrap Themes. There are tons of people who helped me at those frustrating days. Many people left me in between, Thank you for leaving. p.s: There are many stories that I do not want to share publicly. How many hour a day you spend on TV or Newspaper or Radio? And how many hours you spend on Facebook, Youtube, Instagram or browsing any website. Over a year if businesses are not taking themselves online then get ready to exit, sounds harsh? Well, you will thank me someday. Does that mean you must have a business website? Yes, but NO, it’s not enough. 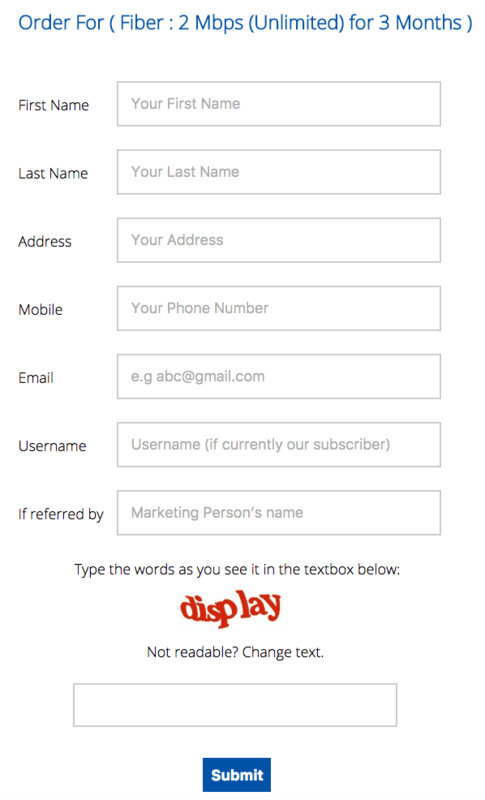 Create a facebook page? Yes but again who is going to follow your business. Create a youtube video? Yes, a must, but why someone come and watch it. For those who have not thought of taking it online, start creating a facebook page, promote a post, create youtube video etc. Or buy me a beer! And for those who have already made it online, congrats & thank you, but you could/should have done……… Well, we can talk that over a coffee! There are some dreams that you cannot achieve, even if you are passionate about it. But at some point you will see another person who is also passionate about the same thing. At those time you can give all your ideas. If not you, atleast someone else will make it real with your small efforts and sacrifice. Learn to make dreams real by letting someone else do it. Have you ever blame your grand parents for some bad decision they made decades back? I do sometime, but I am glad they made many smart decision at their times too. Now its you me & us who have to make the smart decision. Let our grand children thank us for our smart decisions. The Earthquake in Nepal have change many people. The idea of voluntarism have grown a lot in many people. We must appreciate the citizen led effort. If the citizens of Nepal have not acted at first then the immediate relief would not have been possible. The immediately relief is now almost over. NOW? NOW! We need to be visionary even when we are helping. Don’t just make any move with your own idea and brain. Take reference, ask question, study, listen to experts. People of Nepal are resilient, they are very conscious enough about how to save life. The monsoon and rain is lame excuse, people will survive anyways. Quoting to last weeks’ meeting, we had a discussion that the disaster is not earthquake, the next disaster is will be people. If farmer stop doing agriculture then next year we will have to ask for Rice, Vegetables from foreign nations. Are we ready for that disaster? So, lets encourage and teach people to move on. Let the farmers do agriculture, let the school run, let the potter help carry. Many organization, agencies, individuals are taking initiative of temporary shelter homes, but I believe that there must be some exit strategy. The temporary shelter must be demolish or reuse for permanent structure after some time, let the temporary shelter do not turn into slums. If you want to volunteer and continue your humanitarian activity then go to school & camp nearby help the children, help them play & learn. Conduct a team building games for them. Every school students need extra curriculum activity right now. Organization wants to build schools but do you know government have pledge Rs 25,000 for each classroom? Go to nearby government offices there are people who don’t know how to write letter(sifarish), help them write letters. I got opportunity to speak on Volunteerism today at St. Xavier College for the Bachelors in Social Work students. I am Amit. I am a designer by profession. I work for a software company and I also own a design agency and event management. NO! I am not from any INGO or NGO. When someone talks about volunteerism and youth issues people have an impression that this person belongs to a certain NGO or INGO. Perhaps, its been over 10 years of my life that i spend in voluntary organizations and it still continues. I was part of Rotaract as a volunteer. To be a volunteer, for me, is giving your skills, ideas and time for free. There is no such thing called paid volunteering That’s what I believe. I believe that service should not be commercialized. People often ask me how much I get paid by social work and volunteering. There is an adverse influence in our society that if someone participates in social service, they are earning out of it. We have to change this. You have to change this. Volunteerism has taught me a lot, helped me get exposure, and given me opportunity as that of today’s for instance. to address this this number of youth about volunteerism. Volunteerism helped me understand the importance of empathy. Few years ago, I volunteered as a traffic police helper in Thapathali for an hour. Now, whenever I pass that road I remember that time and make sure I follow the traffic instruction. That hour of volunteerism helped me understand the effort that traffic police need to put in their work.. It taught me to be respectful towards others profession. Volunteerism helped me meet new people. Helped me understand the importance of ownership in everything you do. Today I took 2 hours of leave from my office and I am speaking with you here. That’s volunteerism for me. I was looking for o+ve blood and I posted about it in facebook, my friend called me from Jomsom saying he is ready to come Kathmandu immediately just to donate. That’s volunteerism.